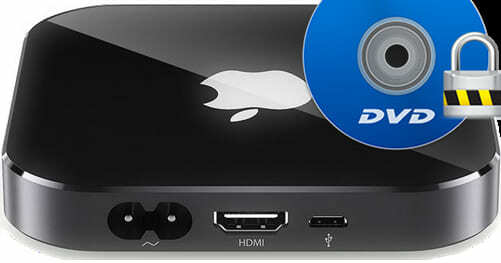 "How do I play DVDs through Apple TV (4th or 3rd generation) on my HD TV?" * Firstly, we are here mainly looking at the means to digitize DVD for playback on HDTV though Apple TV, by DVD ripping or mirroring whatsoever. If Apple TV is not the prerequisite and indispensable part for your DVD playback on HDTV, you should turn to rip DVD to hard drive for HDTV. If yes, then read on. * Again, we are discussing best ways to play DVD on Apple TV 4/3/2, therefore purchased videos in iTunes apparently will not be counted in. * Get down to brass tacks: how to play and watch DVDs on Apple TV (4)? Let's see if you are all set. Needless to say, movie DVD and Apple TV are the basic two things you should prepare in the first place. To rip DVD to Apple TV 4 requires a Windows PC or Macbook Pro/Air and DVD ripper software, while AirPlay server is key to mirroring DVD movie to Apple TV. 2. Accordingly, Apple TV 4 ships with Siri. 3. Supports Dolby Digital 7.1 while Apple TV 3 supports 5.1. "I am going to rip (complete DVD-copies for TV as mpg2) my complete DVD collection, approx 300 DVDs, for copying all the data to my computer to eventually transfer to my Apple TV 3 and maybe later 4th generation." Most people's first thought upon playing DVD on Apple TV/4 is to stream/AirPlay/mirror DVD to Apple TV 4 from Mac or PC, which however has some limits and will be explained later. Some say use VLC media player, which should works but I have never tried it myself. Are there any other ways? Ripping DVD to Apple TV 4 seems to be the ultimate solution, to some extent. Surely, DVD can't be played on Apple TV 4 directly, which is annoying but also can be taken as an inflection point to find yourself an applicable DVD software, for watching DVDs on not only Apple TV, but also iPhone, iPad, Android mobiles, etc. At this point, we recommend WinX DVD Ripper Platinum, for its abundant 350+ preloaded profiles, incl. Apple TV 4/3/2, iPhone 6S/6/5S, iPad, Android, Windows Phone, etc and powerful DVD copy protection removing ability. Step 1. Download WinX DVD Ripper Platinum to rip DVD to Apple TV on Windows PC, or WinX DVD Ripper for Mac to mirror copied DVD movies from Mac to Apple TV 4. Step 2. Insert DVD into the drive and click "DVD disc" to load the media content. An external DVD drive might be needed for some Macbook. Step 3. Set "Apple TV 4", which new profile will be added later, as your output video format. Go to "Output Profile" center, choose "Apple Device", and select "Apple TV 4" (MPEG4/H264) under "to Apple TV Video". *Ripping DVD to Apple TV 4 compatible formats works too: MP4 (recommended), MOV and M4V, which can be found in "Mac General Video". Step 2. Connect your Mac and Apple TV 4 to the same Wi-Fi. Step 3. Click AirPlay icon (besides volume slider) and select Apple TV to enable the DVD to Apple TV streaming. Step 4. And then you can watch DVD on Apple TV 4/3/2. Note: DVD video to Apple TV 4 AirPlay requires iTunes 10.1 and superior, OS X Mountain Lion and later. Despite the fact it has HDMI 1.4 UHD video output on the back, Apple TV 4 does not allow 4K video streaming or AirPlay. For AirPlay DVD/4K video to Apple TV 4 on both Mac and Windows, give 5KPlayer a shot. Step 1. Play DVD on Mac using an external DVD drive (if needed) and 3rd-party DVD player. Step 2. Open "Settings" on Apple TV to turn on AirPlay. Connect Mac and Apple TV to the same Wi-Fi. Step 3. Check "AirPlay Display" settings in system preference on Mac. Make sure it is enabled. Step 4. Click AirPlay button and select Apple TV. Step 5. 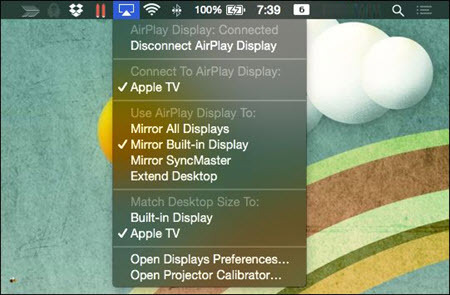 Tap the AirPlay button again and choose "Mirror Built-in Display". Then you will be able to watch DVD videos on Apple TV/4. AirPlay and Mirror of course are impressive video streaming technologies for downloaded and locally stored movie files. But is Mirror the best way for playing DVD on Apple TV 4? Well, it depends. It may take you a while to realize that most DVDs cannot be played on Apple TV 4 via mirroring, due to copyright issues, making DVD rip to Apple TV 4 a necessary step.